690 people went missing in Warwickshire during 2014/2015 (police financial year), according to available data published by the National Crime Agency’s UK Missing Persons Bureau*. Many of these people soon return home to their friends and family. Some do not, often because they suffer from a form of dementia, or they wish to harm themselves. 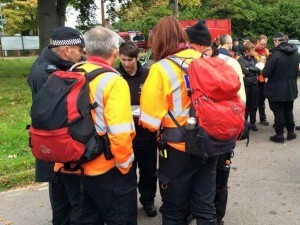 Warwickshire Search and Rescue Team is an operational Lowland Rescue team, set up to assist the Police with searches for vulnerable missing persons within Warwickshire, and beyond. Our team is part of a much bigger family of 36 Lowland Rescue teams in the UK. All teams are members of the Association of Lowland Search and Rescue (ALSAR). ALSAR set the training standards that we all have to reach, and the code of practice that we use, working alongside the police. With Mountain Rescue England and Wales (MREW), Mountain Rescue Committee of Scotland (MRC of S), and the British Cave Rescue Council (BCRC), ALSAR members are nationally recognised as part of UKSAR capability. Our team volunteers directly for Warwickshire Police, providing valuable search management services and physical resources to search on land and inland waterways. We are usually called out by Police Search Advisors, but this can vary between police forces. It is important to mention that we cannot be called out by members of the public, only by government agencies. We often get called out by neighbouring Lowland Rescue teams, as well, to assist them in police searches within their areas. Most of our work involves locating high risk missing people, those most at risk of injury or loss of life, either through their own actions, their environment, or due to illness or injury. However, Lowland Rescue teams can be called upon for other tasks, such as helping people in flooded areas. All team members are unpaid volunteers from all walks of life, from 18 to 80 years old. We are available to respond to callouts 24 hours a day, 7 days a week, every day of the year. As well as search management personnel, team leaders and search technicians, Warwickshire Search and Rescue also has a search dog team and a specialist kayak team. To learn more about the roles within our team, or to find out how to join the team, click here. We are a registered charity**, and, when we’re not out searching or training, we are often at various locations in Warwickshire, raising much needed funds for equipment for the team, things such as first aid kits and vital software. However, we really appreciate support from local companies too. If you would like to help us save the lives of others, please visit our Support Us page.